Optional Add Ins: ¼ cup chocolate chips, candies, nuts, dried fruit – you get the picture. Place caramels, butter and milk in large microwave safe bowl. Microwave on high for one minute. Remove and stir. Repeat step one until the caramels are melted. Our microwave takes 2 minutes. Remove from microwave and add crispy rice. Stir until coated. Let cool slightly and stir in any add ins. Cut or sculpt into shapes or press into lightly greased 9 x 9 pan and let cool. 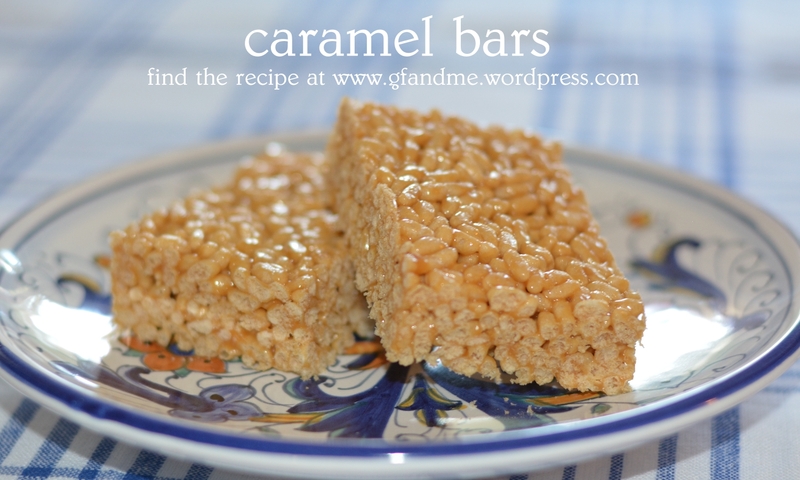 This entry was posted in Baking, Drinks & Desserts, Recipes and tagged celiac, easy, GF, gluten free, gluten free in Red Deer, Kraft caramels, recipe, rice krispies, squares. Bookmark the permalink. Looks wonderful. I never had them with caramels. Thanks. Just as easy as the marshmallow treats but a bit different! Love the addition of caramels. Sounds better than the marshmallow version! Thanks! If you like caramel like I do, it’s definitely better! Will try soon…maybe pumpkin shaped for the boys’ Halloween birthday party! Thanks. Yes it was the caramel that sold us at first too! I’d love to try one of those. They are awesome – and sooo very easy. I whipped up a batch this afternoon, though I put the mixture into paper cases inside a muffin tin. Thank you for this quick and easy sweet treat. I’ll add chocolate or craisins next time. Ooooh, craisins! Yumm. Glad you enjoyed them.